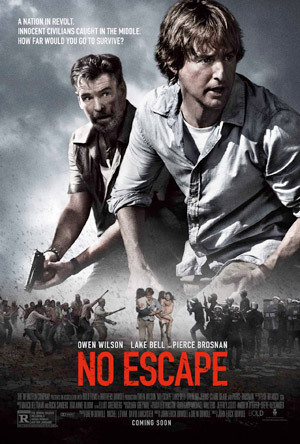 Owen Wilson, Lake Bell and Pierce Brosnan star in the thriller No Escape. Watch the movie trailer below. An American family in Southeast Asia soon finds themselves caught in the middle of a coup, and they frantically look for a safe escape in an environment where foreigners are being immediately executed. MPAA Rating: R for strong violence throughout, and for language. An intense international thriller, “No Escape” centers on an American businessman (Wilson) as he and his family settle into their new home in Southeast Asia. Suddenly finding themselves in the middle of a violent political uprising, they must frantically look for a safe escape as rebels mercilessly attack the city. Directed by John Erick Dowdle and written together with his brother Drew, “No Escape” stars Owen Wilson, Pierce Brosnan and Lake Bell.